We've all experienced it. The dopamine-filled highs of watching site stats blast through the ceiling on our favorite web analytics platform after a piece of content goes viral. As digital publishers, it's in our blood to crave these spikes. But the sobering crash back to reality that follows, and the ensuing scramble to come up with the next piece of content that can match the previous peak, are seemingly inevitable. This constant seesawing is a frustrating and fatiguing experience, no matter the size of your budget or marketing team. What's a publisher seeking stability to do? Are we all targeting the right goals, or is there more here than meets the eye? Turns out there is more to your stats than just those towering summits. It's the concept of valley elevation, and it's been staring you in the face the entire time. Coined by Bradley Schwarzenbach and popularized by bestselling author Andrew Davis, valley elevation posits that you should be focusing on the depth of your metrics' troughs instead of its peaks. RebelMouse-powered Azula's pageview performance following their replatform to our technology at the end of August 2017. Applause-worthy peaks abound but, more importantly, we see strong valley growth three months post launch. Instead of chasing the next high, successful publishers focus on ensuring that their next drop isn't as deep as the one before it. 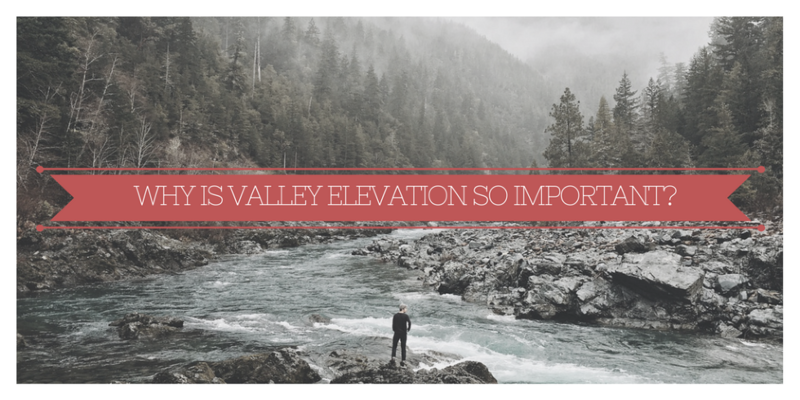 Why Is Valley Elevation so Important? If we had to bet, chances are not every single piece of content you publish is hitting it out of the park. (Though if they are, kudos to you! We'd love to know more about what's working in your world.) In the regular world, content traction ebbs and flows depending on numerous factors, such as the quality of your creative and technical work, the breadth and depth of your audience, and whether or not the algorithms wake up on the right side of the bed. And like most, your site stats are going to spend more time on the ground than in the clouds. This is why exciting spikes are not a true measure of the health or success of your site's traffic and engagement, nor an ironclad indicator of how well you and your team are (or aren't) performing. Like most things in life — stock market growth, raising a child, pursuing higher education — it's a marathon, not a sprint. You want to focus on best practices that will result in your valley floor steadily growing in elevation over time. Put another way, which of the following scenarios sound more appealing to you? Your site publishes content that goes viral a handful of times a month. But virality is fleeting and never guaranteed. And on days when your content takes off, your audience is largely unrecognizable. A flash mob that's gone as quickly as it came. You've satisfied the trending flavor of the moment, and you're lucky if they even noticed what site they were on before they left. Your site publishes content that does not go viral as often as in the first scenario. But when your audience does show up in droves, they stick around and consume your other content. When they invite their friends to check out your articles, those new faces stick around, too. And they all come back periodically, whether or not you've recently published something earth shattering or not. It's a rather stark comparison, but you'd take the second option every time. It's compound growth built on audience loyalty that you can reap the benefits of weeks, months, and years down the line. "It's only when the tide goes out that you discover who's been swimming naked." What Does It Take to Grow a Valley? In truth, there may not be a limit to the number of ways you can grow your valleys. But the resounding theme, as we're sure you've noticed, is that you're constantly in tune with what is relevant to your audience, and operating around those needs without neglecting any one area. The right balance and direction may not always be exciting, but investing in a solid foundation tends to net exponential gains over the long run. 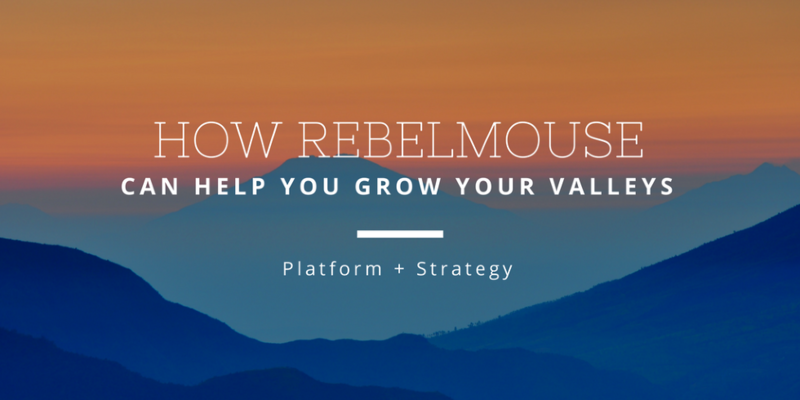 Earlier in this post, we showcased Azula's strong valley growth after three months of being on RebelMouse. Here's a broader look at how Azula has been doing since the end of August 2017. True to what's expected, Azula has experienced a number of peaks and valleys over the past seven months. But as the trendline demonstrates, the majority of their valleys have settled at an elevation far above where they were when they started out on RebelMouse. That's the result of a loyal, growing audience consuming content on a 24/7 basis — not only when a grouper swallows a shark in one bite. At RebelMouse, we have years of experience building digital properties that attract fervent audiences. Our global team is well-versed in every audience-building discipline, and our guidance is backed by and tested against mountains of data we've collected over time. RebelMouse Platform: If your current platform isn't delivering the technical results you need, or hindering day-to-day operations, then we invite you to take a look at RebelMouse. Back when we began the company, we saw ahead of the curve and deliberately built our platform around social in every way. The culmination of our efforts resulted in what we call Social UX for Media, which propelled Axios into the limelight and turned it into a household name in under a year. Used in tandem with our proprietary Discovery functionality, you have all the tools you need to build a loyal audience that will jumpstart your valley elevation growth. Strategy Services: Media companies and brands alike often find themselves with surprisingly large divides between the key teams that drive the business. Editorial, data, product, sales, marketing, and revenue can all end up unintentionally working together in frustrating relationships and processes. Simultaneously, all the changes that are happening in digital distribution can cause greater conflict within the teams when figuring things out together, as well as create new obstacles. Bridging these gaps in a positive way that leads to an excited, happy culture with tangible loyalty metrics, new reach, and growth opportunities, is at the very core of what we do. A Combination of Both: A number of our clients build their properties on RebelMouse and lean heavily on us daily for our expertise. These are some of our favorite partnerships, as the line dividing us starts to blur and we morph into one big family, united in our pursuit of the same desires. Whether it's the Rebels for Good site network, or working side by side with founder and CEO Paul Berry, we provide something for everyone. If you're interested in what it takes to migrate to our best-in-class CMS, or would like digital strategy help to get your current roadmap off the ground, contact us today. We'd love to discuss a potential partnership and succeed together.